The Beaver Creek Boulevard Streetscape Project was expected to be complete by November, but after getting a late start and not putting enough resources into the project during the early phases, contractor Hudspeth Inc. will now have to focus on completing only the western side of the project this year. 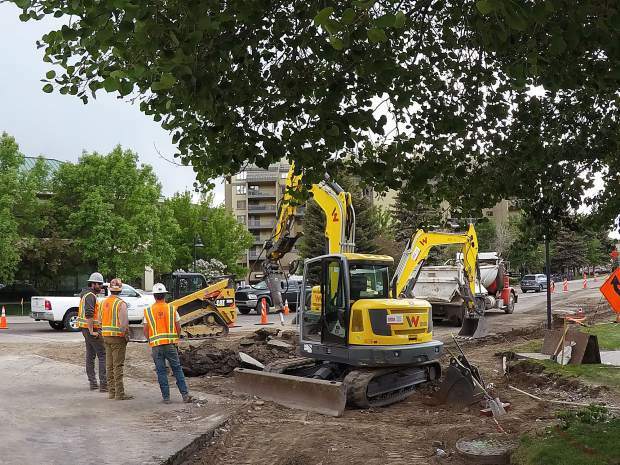 AVON — The general contractor on the Beaver Creek Boulevard Streetscape Project is behind schedule and soon will be forced to shut down the project for the winter. The project, known colloquially as Avon’s “road diet,” seeks to narrow Beaver Creek Boulevard from its current, multi-lane format into a road that will have 11-foot vehicle travel lanes, 6-foot to 10-foot-wide sidewalks, more crosswalks, approximately 25 parallel parking spaces, left turn lanes into Christie Lodge and Avon Center and reconfigured Sun Road and Lake Street intersections for improved visibility. The project was expected to be complete by November, but after getting a late start and not putting enough resources into the project during the early phases, contractor Hudspeth Inc. will now have to focus on completing only the western side of the project this year, said town engineer Justin Hildreth. There is a penalty for missing the deadline, Hildreth said, which is currently being examined by the town attorney. “If they do not perform the work and I do need to hire somebody to complete the project … they would be responsible for any additional costs,” Hildreth said. In 2016, the Avon Town Council approved and budgeted the project, with $2.7 million allocated. In April 2018, the council approved an additional $915,204 for the project, bringing the total to $3,827,000, with a contingency of $180,350. Construction started in May. Hildreth said at this point, the work is not far enough behind to warrant terminating the contractor. “If I need to bring somebody else in to complete the work, for winter … then yes, we would terminate them,” Hildreth said.